As part of the years 5 & 6 Physical Education program at Benalla P-12 College, all students complete an intensive swimming unit in Term 1 which is completed in our own 25 meter pool located at the Faithfull campus. During Term 2, there is a strong emphasis on developing and mastering each students fundamental motor skills like the strike, kick, throw & catch. Once these skills are mastered, students go on to complete units on gymnastics, athletics and sports specific skills in order to be successful in a wide range of different sports. In years 7 through to 10, students undertake a comprehensive 4 week block on each of the 24 different sports undertaken at Benalla P-12 College. For each sport, we aim to develop and improve students social, tactical and physical skills needed to succeed in that sport. Some of these sports include gymnastics, netball, football, cricket, badminton, golf, hockey, basketball, soccer, rugby, tennis, baseball / softball, athletics & swimming. Our years 5 – 10 Health curriculum enables students to develop a strong sense of self, to build and maintain satisfying relationships, to learn how to be resilient and to help make lifelong informed healthy decisions. Some of the topics covered include fitness & lifestyle, diet & nutrition, relationships, sun smart, water safety, personal health, drug education, mental health, sexuality, first aid, bullying (cyber, verbal, physical), rites of passage & driver education. Which is ran by the school nurse and covers all the programs and organisations available around Benalla for students to access when dealing with all the different health & wellbeing issues which students may have to deal with. This program is optional for year 11 students to attend. Students go to either the Wangaratta or the Alfred hospital in Melbourne. Nurses & doctors from the Trauma section of that hospital inform students about what happens in that section of the hospital as a result of major incidents and accidents in the community. The program aims to educate and expose students to an experience of life post trauma with the view to altering their perceptions of risk-related activities such as drink-driving. 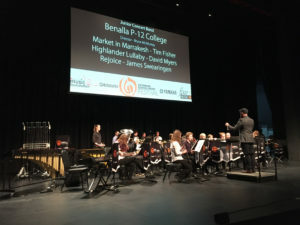 Benalla P-12 College has a highly successful music program offering students a rich musical experience for beginners through to advanced instrumental education including VCE Music courses and VET Music. Teaching and performing is accommodated at the Performing Arts Centre (PAC) at the Faithfull Campus of the College with some classes and lessons provided at the Barkly Street Campus for senior students. Bryce McMurray – Classroom Music and Year 8 Band. Students participate in bands and ensembles and regularly perform at local events, festivals and are offered a range of music camps and tour opportunities throughout the year. Each lesson consists of a combination of activities. Students sing songs and use tuned and untuned percussion to create ensemble accompaniment. The lyrics are also discussed and sometimes altered. Students have also created rap performances after looking at rhythm and rhyme patterns. Singing in rounds has also been done. Students have also used body percussion and dance to enhance musical performances and have improvised dances in small groups. Recordings and sometimes video clips are listened to and discussed. In term 1, the recordings were all about using voices. This term they have all been original soundtracks and the music has been analysed to identify how composers create mood and colour. Non-Western music is also shared including recordings from South America, Indonesia, Africa and Japan. Students have learned to tune, repair and play guitars. So far most are familiar with three basic chords, and these will be extended in the future. A variety of instruments are played, discussed and analysed including non Western instruments such as didgeridoos and African thumb pianos. Basic music theory is also taught through games and in ensembles, including notation of treble clef notes, rhythm and some musical terminology. Major and Minor chords are identified and explained. Pentatonic scales are used for improvisation. The Stephanie Alexander Kitchen Garden Foundation (SAKGF) exists to develop happy and healthy life-long eating habits in a new generation of Australians by engaging them in growing, harvesting, preparing and sharing delicious and healthy food at primary school. The Kitchen Garden Program has been developed by world renowned chef and writer, Stephanie Alexander and Benalla P-12 College is proud to be part of this wonderful program. Students from Years 3 & 4 from the Waller St and Avon St Campuses spend 2 hours each week in a kitchen classroom preparing and sharing a wonderful variety of meals created from produce grown in our own vegie gardens. They also participate in a 45 minute weekly garden lesson held in the vegetable garden following organic gardening principles. Amanda Grimwade is our Kitchen and Garden Specialist, run these sessions. In both the kitchen and the garden the children work together in small groups with the assistance of volunteers. In the kitchen the finished dishes are arranged with pride and care on tables set with flowers from the garden, and the shared meal is a time for students, helpers, teachers and specialists to enjoy each other’s company and conversation. Throughout the year, the students invite family and community members to experience the Kitchen Garden Programme through our Autumn and Spring Harvest Festivals. The students also have the opportunity to be involved in the wider community through visits from our more senior residents, the local garden clubs and participation in the Benalla Festival. Through their involvement in the SAKGP students learn to work cooperatively, share resources, respect each other, see teachers in a different learning environment, gain enjoyment and have fun working in the garden and kitchen. Working in the garden is a physical activity. Students’ plant, compost, dig; collect the eggs from our chooks and develop an awareness of the environment and plant diversity. Students learn a new language to describe foods, plants, textures and flavours. They use maths to measure and weigh, they learn that new experiences can be rewarding, and their self-esteem, confidence and sense of achievement is enhanced. They learn to work as part of a team. Experience in the kitchen not only introduces students to new foods and recipes, it also provides them with kitchen skills such as using a knife safely and effectively, managing hot stoves and saucepans, and using other kitchen equipment. So good are these experiences that the students are motivated by the pleasures of good food, and develop an appreciation for rituals and tastes that will last a lifetime. There are two unique factors about the Kitchen Garden Program. The first is the intrinsic link between the garden, the kitchen and the table. The emphasis is on learning about food and about eating it. No part of the Program can exist without the other. The second factor is that the Program is embedded in the curriculum. At Benalla P-12 College, we offer an Indonesian Bilingual Program from Grade 1-6 at Avon St and Clarke St Campuses. This program is recognized as unique, especially as it is located in country Victoria and has been established as a pivotal educational program for more than 15 years in Benalla. The Benalla P-12 College Leadership Team strongly supports this program and is committed to its development and continual improvement and growth. In this program, children spend 50% of classroom time listening and working in an Indonesian language environment. The process used to teach Indonesian language in this program is called immersion. At Benalla P-12 College, children will journey through these stages to gain a commendable fluency and understanding of the Indonesian language. The immersion program is constant and consistent; it is continuous through activities in Literacy, Numeracy, Art and Music.